Stretching from Ocean Beach right through to Stanyan Street, Golden Gate Park is even larger than New York’s Central Park. The fact that it all used to be sand dunes until 1871 when the parks first supervisor, at the tender age of 25 oversaw the development of the first horticultural foot steps, is also amazing. William Hammond Hill was charged with creating an oasis for San Franciscans and visitors alike after the area was deeded to the people of San Francisco in 1870, which would have coincided with the first seeds of “society”, being established. The idea was that at some time in the future, the population would be grateful for a place to escape the crowds which were bound to flood to San Francisco – how prescient! The scale of the park and the attractions within are fairly mind-blowing; the sheer size fits the super-size me image of the USA. Hammond Hill did a good job of organising the park space and beginning the establishment of the many trees that are there today but the real defining structural elements of the park have their roots in 1894 when the Midwinter Fair was held to boost the economy and visitors to San Francisco. This large expo and carnival was to show off the area and accordingly a fine arts museum was built which illustrated the cultural elements of the city and horse stables were erected with large un-landscaped areas alongside for recreation. To reference the quirkier elements of the city, exotic and themed areas were included such as Cairo Street, the Japanese village and the Eskimo habitat. What was begun in the late 1800’s carried on throughout the twentieth century and right up until the present day. The park now has recreation facilities that would rival any park in the world, with basketball, archery, cycling, skating, handball, tennis, a nine hole golf course, disc golf (!) and many others catered for with equipment hire and courts available for all. Outdoor pursuits are certainly on offer to everyone – even fly fishing and boating is available on Stow Lake and the smaller Spreckels Lake. A good day hike would be to go up Strawberry Hill in the middle of Stow Lake and enjoy the fantastic views around you. Kezar Stadium is a 10,000 seater outdoor stadium for anyone to rent, with a good outdoor running track. For the horticulturalist there are gardens dedicated to roses, tulips and a multitude of flowering shrubs which span the seasons. 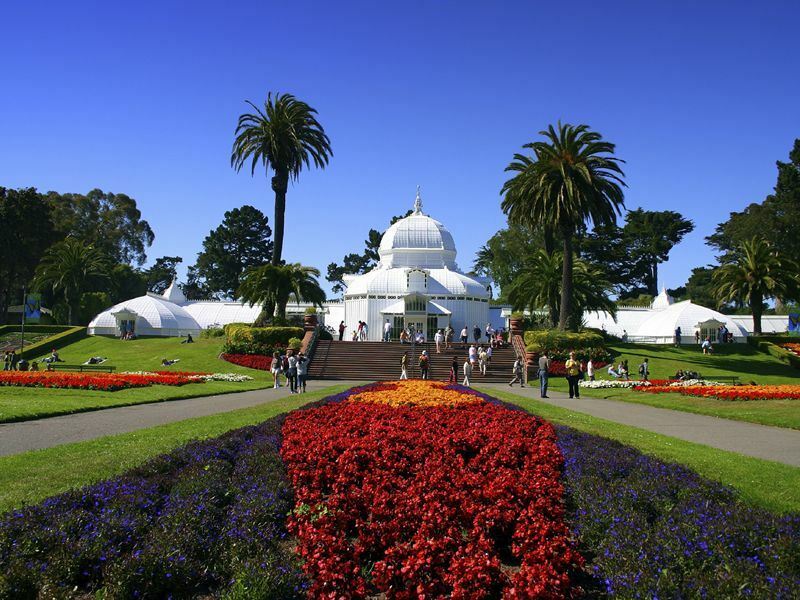 Alternatively visit the conservatory of flowers, a kind of mini-Kew with the oldest glass and wooden Victorian greenhouse. The first Tuesday in every month is free entry. The garden of Shakespeare’s Flowers combines a literary twist for keen thesp's. The Botanical garden sits on 55 acres at Strybing Arboretum and houses many different species. In recent times the de Young Museum has been re-opened with a large collection of Native American artefacts and findings from the settlement of San Francisco, with worldwide cultural items. Again, each first Tuesday in the month is free entry. The Californian Academy of Sciences houses a planetarium, an aquarium and a rainforest dome. In all, 38,000 animals from 900 species are represented, excluding the Buffalo Paddock where you can watch bison. There is clearly something for every member of the family in Golden Gate Park and it is much valued by San Franciscans and visitors alike. If you do one thing, visit the Japanese Tea Garden which is free before 10am on a Monday, Wednesday and Friday. Enjoy the paths and bridges which twist around the plants before enjoying a refreshing cuppa – Japanese style. Whilst there pick up the statues guide for the park which is more like a treasure hunt as John McLaren, the head gardener for 50 years objected to sculptures disrupting his garden, so “hid” the works of art. You’ll have to root through the foliage to find some of them! Article written by Justin Mewse.